Our "Top of the Line" unit! More powerful and larger than any other. Expands to a giant 30 trays so you can dry large quantities all at once! 1000 watts of drying power means you can dry more, faster. Patented Converga-Flow? 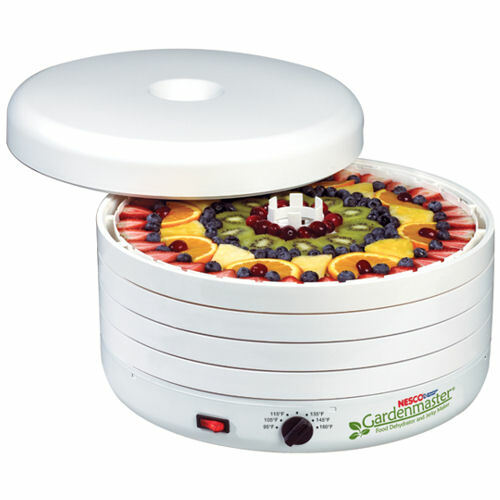 fan forces heated air up the exterior pressurized chamber, then horizontally across each individual tray, converging in the center, for fast, even and nutritious drying. No flavor mixing! No need for tray rotation. Expandable to Meet Your Needs! As needs grow, this four-tray unit can be expanded with accessory Add-A-Trays?, up to 30 trays (30 sq. ft.) Drying pressure adjusts automatically to the number of trays.
? 4.5" Fan, 2400-RPM Motor.
? Expandable to 30 trays. No Tray Rotation, 1 Sq. ft. Per Tray. Tray size 15 1/2" in diameter.